This research project starts from a simple, but fascinating, realization: airports are almost always symmetrical in configuration. Symmetry at urban scale obviously facilitates the ‘legibility’, and creates what we could call ‘horizontal monumentality.’ Besides, contemporary navigation technology such as ‘Google-Earth’ or ‘Virtual-Earth’ has shifted back the focus on monumentality from verticality to horizontality. In contemporary urbanism, the image is more real than reality itself: the image is how we navigate the city. We would like to shift Venturi’s argument to introduce such signs and symbols at the horizontal scale. 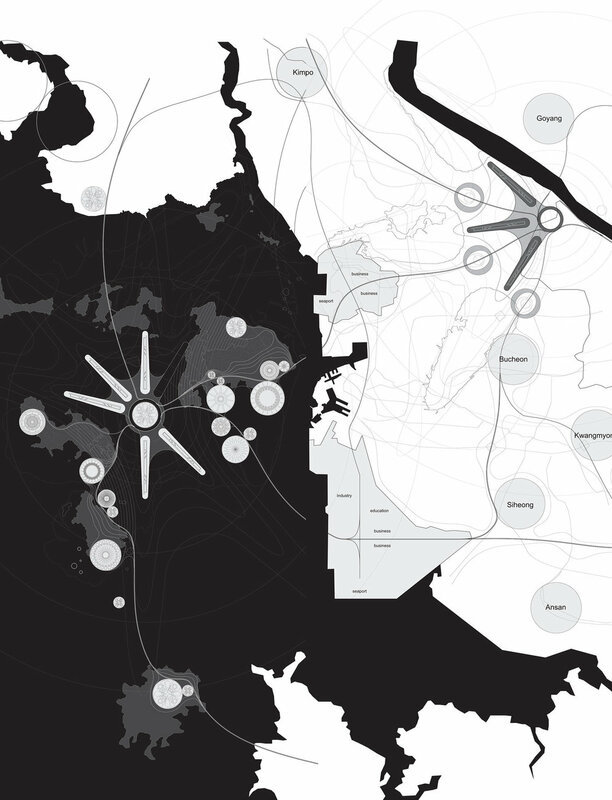 The thesis posits that airport urbanism has four notable points: ‘Horizontal Monumentality,’ ‘Symmetrical Ordering System,’ ‘Productively Scaleless,’ ‘Centrifugal Point Urbanism.’ This thesis proposes a centrifugal radial system, which puts the airport at the center of configuration along with some larger scale social infrastructures such as convention centers, theme parks, and agriculture. The airport will be located at the center. Agriculture development will match the high level noise contour. In between space, commercial lines will follow major traffic lines. The residential area is interwoven networking them all.